HVO is a premium fossil free diesel product made of 100% renewable raw materials, which does not release any new carbon dioxide into the atmosphere. It is produced by hydrotreatment of vegetable oils and/or animal fats, and the result is a premium quality fuel with a chemical structure almost identical to regular diesel and can therefore fully replace fossil diesel. Pure HVO, HVO100, can be used in diesel engines without modification and is approved for all heavy vehicles of the market leading engine manufacturers such as Scania, Volvo, Mercedes, MAN among others. Fossil free diesel HVO is significantly better for the environment than fossil diesel, while keeping up with equal performance. HVO can be used immediately without modification of engines or infrastructure. In addition, HVO has better combustion, filterability and cold temperature resistance than other diesel products in the market. HVO (Hydrotreated Vegetable Oil) is a completely renewable diesel alternative based on vegetable oils, grease waste, or residues from e.g. food industry and agriculture. When refuelling HVO100 from Biofuel Express, you can reduce CO₂ emissions by up to 90%, compared with conventional diesel. The cetane number for HVO is between 70–90, which is significantly higher compared to 50–60 for fossil diesel. It provides extra power to the engine and more efficient and cleaner combustion that reduces soot in engines and exhaust systems. HVO 100 complies with the EN15940 specification and the standard for diesel fuels EN 590, except for the density that is about 7% lower. It works seamlessly on all modern diesel engines in buses, trucks and construction machinery. Biofuel Express is a reseller of the world leading HVO100, Neste MY Renewable Diesel™. 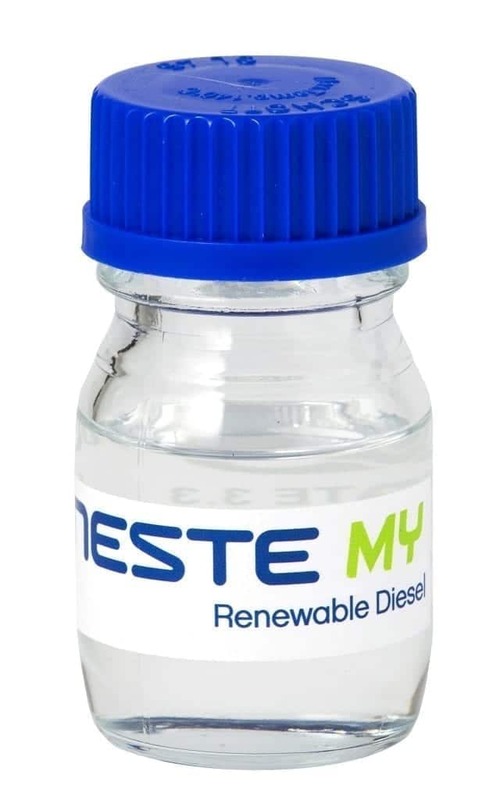 Neste MY Renewable Diesel™ HVO is a premium quality fossil free fuel that reduces greenhouse gas emissions by up to 90% and works well in all diesel engines, without any special adaptation. Just simply refuel and you are ready to go!